A towel warming machine cabinet produces hot & UV sterilized towels on demand (Source). Ideal for spas and residential use, nothing is quite as satisfying as a hot towel draped over your shoulders after a massage, or to help soothe achy muscles. We took a look at bunch of towel warmers and, for the most part, they're complete junk! We did find a couple that were decent- our top pick is the Mini Elite. Scroll down to watch a video review. Buyers say that for a massage business, this option is great to wipe off excess massage oils. Buyers say that it heats towels really well and is small enough that it doesn't clog his parlor. One buyer explained that he doesn't have to fill it to capacity because he only needs 6 towels max a day, but it's definitely capable of handling 12 washcloth towels at at time. Best practices include wetting the towels prior to inserting them and ensure that the the drip tray is installed. You'll also want to make sure you give it a good wipe down when you're not using it to ensure mold or mildew doesn't build up. Let's take a look at 5 of the top-selling towel warming cabinets on the market today. If you are wondering how to warm and sterilize your towels quickly and without much effort, you might want to consider this LCL hot towel cabinet. Users love that they can have warm towels whenever they want and that they get extra 24 ultra soft towels with the package. However, some do note that the towels they receive aren’t thick or big enough. 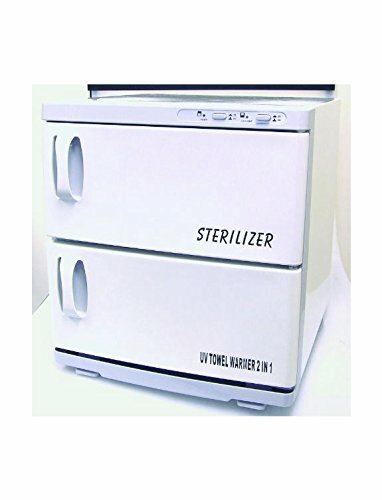 With an external size of 12″ x 12″ x 17.5″ and an internal size of 8 1/4″x 5 3/4 x 13″, this hot towel warmer sterilizer has a capacity for 32 facial towels or 70-80 disposable ones, and it includes a spare ultraviolet bulb and a drip tray. Since it could be used either as a sterilizer or a warmer or both at the same time, it seems like a good choice. One user shares that he loves the heated towel cabinet, and it’s both a necessity and advantage in his job as a barber. A pleased buyer comments that he is very pleased with the quality and the price of the hot cabinet. Another one says loves the feel of the warm towels, but he can’t keep as many thick towels in it, as he would like. A customer with mix feeling states that the LCL Beauty hot cabinet works as it should, but it’s not the quality he wanted. He also states that the tray and towels are low-grade, and the capacity of LCL warmer too small for his needs. This LCL Beauty towel warmer sterilizer is well-designed, lightweight and effective for warming towels and sterilizing tools. Users love its compact shapes, how quickly it works and how easy is for them to use it. However, some do note their heated towel warmer leaks despite the drip tray or that the size is smaller than they expected. With an internal size of 7.5″x 9.25″ x 7.25″ and an 8 .25 liter capacity, this hot towel cabinet heats up your towels up to 175 Fahrenheit, and 12 towels with a size of 10″ x 19.5″ are included in the package, plus a spare UV bulb. Overall, it seems a good and reliable product if you are looking for a balance between quality and price. Generally, purchasers are mostly satisfied with the performance, size, and price of the hot towel cabinet. One user shares that he has used the sterilizing option for facial brushes and tweezers. He says that the compact shape makes it perfect for his home spa, and he would recommend it without a second thought. Another pleased buyer comments that the towel warmer cabinet is perfect for his bathroom, and he could fit one large bath towel in it without problems. Customers are also happy with the quality of the towels they received, but some of them complain that the electric towel warmer cabinet takes a lot of time to properly warm their towels. If you are looking for a high capacity warmer cabinet, you might want to take a look into the LCL Beauty hot towel cabinet/sterilizer. Users love its enlarged design and that they can warm over 140 disposable facial towels with it. However, some do note that this big towel warmer has leaking problems. With an internal volume of 22 liters and a size of 21″ x 18″ x 14″, this heated towel warmer can fit 64 terrycloths facial towel in its two individual cabinets. It includes two removable towel shelves and 48 facial towels. The sterilization feature can be used on glasses, brushes, and pedicure and manicure tools. 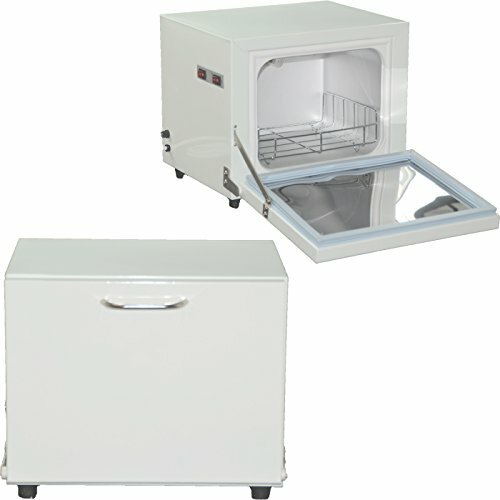 Generally, users have mixed feelings regarding the high capacity warmer and sterilizer. One user shares that the towels have good texture, but they are too small. He complains that hot water leaks after opening the door due to condensation, and it’s not a good idea to use it over carpets or wooden surfaces. Another unhappy customer states that his hot towel heater broke after three months, and he wouldn’t recommend it to anyone. The happy purchasers, on the other hand, share that they are satisfied with the performance of the towel streamer and that it’s efficient, quick, easy to use and clean. This BeautyPro hot towel kit is lightweight, stylish and useful if you want to have hot towels at your disposal. Users love that this steamer towel kit warms towels in no time and that it includes metal tongs to safely handle the towels. However, some do note that it may warm the towels too much, and it’s not a good idea to try to take them out by hand. To use this towel warmer steamer you have to put water in the bottom, turn the machine on and wait for it to steam the towels. It automatically shut-off when the water runs out and the package includes six hygienic towels. Overall, it seems a bit overpriced since the bowl and the cover are made from plastic. Users have mixed opinions about this hot towels steamer. One user commented that he thought the kit would not be very useful for his spa salon, but it turned out he was wrong. The towels’ size was perfect for facial treatments, and they got ready for about 10 minutes, so he would recommend it to anyone wanting to have a fast hot steamer. Another buyer states that the steamer kit works as expected, but you have to careful with the bowl and cover. 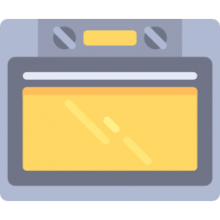 Some users have complained that this hot towel unit is too loud and sounds like an egg timer, while others state that it’s cheaply made and starts to leak after a few uses. The AW hot towel sterilizer and warmer seems lightweight and an easy to use tool for removing germs so that you can always have clean and hot towels for your clients. Users love that they only have to plug it in to use it and that it has shelves on the inside so that they can store the towels. However, some do note that they had encountered power problems. With a 16 liter capacity, the inner chamber of this heated towel cabinet is made from aluminum for better heat conduction, and it can comfortably fit 32 terry facial towels, and around 70-80 disposable ones. It also includes a removable tray and a user manual. 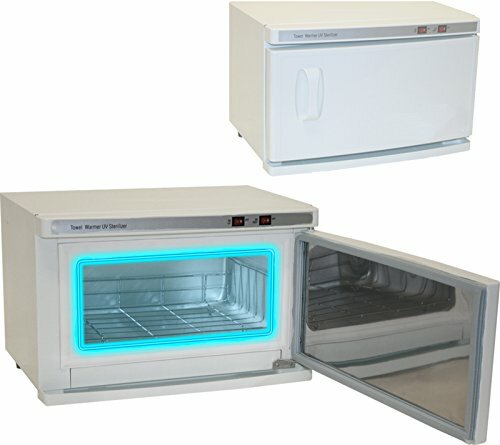 Users have a mixed reaction when it comes to the AW sterilizer and warmer cabinet. One user states that for him using this warmer cabinet is dangerous and expensive. He shares that when he left the warmer plugin, even though he had turned off the power button the rubber gasket of the door melted due to heat. The hot towels cabinet had warmed up, and it could have caused a fire. Another unhappy customer comments that the power source was damaged. He wanted to return it but was very disappointed when he realized how expensive it would be. Some pleased customers, on the other hand, express their satisfaction with the speed of the electric towel cabinet and comment that it’s ideal for a massage practice. There are a variety of different sterilizing towel warmers available on the market today. One of the first ones we examined was the Annie international sterilizer towel warmer. This particular product can hold around 72 12" x 12" facial towels and it has dual functionality enabling it to sterilize other tools, as long as they are high temperature resistant. The TISPro SX1000﻿﻿﻿﻿ hot towel cabinet was another decent option. This 17 lb. hot towel cabinet sterilizes as it steams and can hold 24 face towels at a time, heating up to 176°F. It includes one shelf and one slide out water tray, and is primarily designed for smaller areas that have limited work-space. Its manufacturers say that it is ideal for dentist offices, gym locker rooms, salons, nightclubs, chiropractic facilities, hospitals and boardrooms, as well as for common residential use. Importantly, it also includes a one year warranty, so you can be relatively confident that if it breaks down soon after you get it that you can get a replacement or your money back. One buyer we spoke with who runs his own massage therapy business says that while this may not be a namebrand product, it is ideal for his practice that uses primarily 100% cotton hand towels that measures 16" x 27". It generally takes about half an hour for the towels to be heated up to the max temperature. Other buyers say that it is not a pure white color, it is actually an off-white, so if that matters to you, be apprised of that before purchasing. Some users have complained that it produces a weird smell the first couple times to use it, while others have not noticed this at all-so if this occurs for you, it will probably go away. The LCL Beauty towel warmer and ultraviolet sterilizer was another option we examined. This sterilizing towel cabinet enables you to run sterilizing and heat functions individually, or even at the same time. It will also keep your towels at a warm and comfortable 175°F as well as using ultraviolet rays to sterilize different devices and tools. Users were impressed by its removable towel grill, how easy it was to clean the included drip tray, the power of its 175 Watt engine, and the separate power buttons so you are not forced into running the UV function if you don't require it. The manufacturers say that they have engineered their sterilizing cabinet and towel warmer to utilize ultraviolet rays to sterilize microbes, bacteria on a variety of different instruments so that they are clean and safe to use for your next client. The manufacturers also recommend that you replace the ultraviolet bulbs around every six months so that their sterilizing strength remains effective- though to be sure, the lifespan will completely depend on how frequently you are using this sterilizing & towel warming cabinet. The BeautyPro﻿﻿ hot towel steamer kit is, by contrast, a much smaller device, and more consumer-friendly band the previous two options we just highlighted. Admittedly, this particular towel warmer has received mixed reviews- with some users saying that they received a defective product that did not heat up, or others saying that its construction is really flimsy. Primarily, reviewers complain, it is a cheap plastic container that is mounted on a hot plate. In order to fit six towels into this device, as manufacturers claim, you will have to bunch them up extremely tight, which is not very convenient for daily use. Other users say that the plastic construction is completely unsuitable to withstand electric heat- with some saying that it is actually a fire hazard. For that reason alone, we would not recommend purchasing this product, though other users we interviewed do say that they have been successfully using it to steam towels for facials and provide stress-relief for sore body parts. Another buyer who operates a mobile massage practice says that it is a pretty low-quality unit, though it is lightweight enough to serve her purposes. Another commercial towel warmer we examined is the AW 5L towel warming cabinet. This 9 lb. product has 200 W of power at 110 voltage and measures 8.25" x 10" x 11.5". Its manufacturers say that it is ideal for residential and commercial purposes, using a micro computer to provide temperature control and an average of 158 Fahrenheit and 70 Celsius. It has a towel capacity of 10 to 15 pieces at a time, which is relatively abundant. Again, user feedback was pretty varied for this particular towel warming cabinet, with some users describing it as a powerful little box that they have used over and over, while other buyers saying that their units broke down after a couple of days or after several months. One buyer we spoke with said that it is perfectly sized for their residential massage room, enabling them to fit in 4 large wet towels, while not taking up a ton of space. The last option we examined was the high-capacity, LCL Beauty towel warmer. Its manufacturers say that it is CE certified, heats up to 175°F, can fit 32 terrycloth facial towels and ships with a one year manufacturers warranty. Indeed, as we have seen, there are not a lot of reliable options on the market if you are looking for a towel warmer. That said, if you're looking to warm your towels you are also undoubtedly interested in sterilizing them. If you don't sterilize them from time to time the fabric will begin to smell which is an indication that germs and bacteria have begun to grow on it, which is not something you want to wrap your naked skin in.